touches of sense...: Are we not content? My mind was a horrific blank. I would never get to see Birnam wood for the trees. It was perhaps the curse of the Scottish Play. So proud had I been to be given the starring role, so confident was I that I would be able to pull it off with a minimum effort, I usurped my position, I didn't respect the author who had given us custody of his work. I grabbed a copy of the book, nobody seemed much to care, the other kids didn't know their lines either. That didn't make any difference to how I felt. I felt that I was cheating. As the play advanced, fragments of the key monologues came back to me, I was able to pocket the book. "Is this a dagger that I see before me, the handle toward my hand?" "It is a tale told by an idiot...signifying nothing." Apart from breaking a glass just before the appearance of Banquo's ghost, things went pretty well. The audience seemed generally enthralled by our performance. We even got a laugh when the ghost screeched out in agony (he walked on the broken glass). 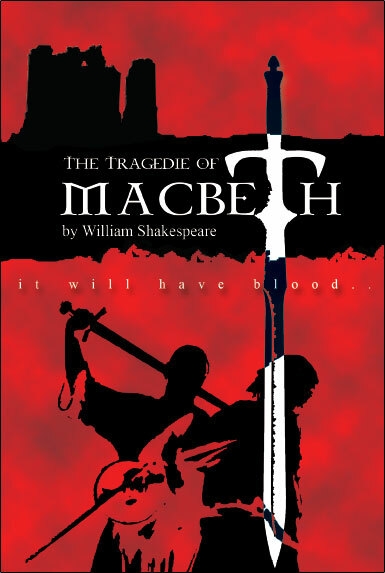 "Blood hath been shed ere now..."
Thrilled by the applause, I decided that I would have to take things a bit more seriously and learn my lines. With mastery of the text, I would really be able to appreciate the play, immerse myself in the action. I decided that I loved Shakespeare. I was very fortunate that I had teachers who let us play, and one in particular who let us discover the blood, the terror, the laugther, the beauty of the text which might have seemed so disconnected from us. We went to Stratford, we marvelled at the Tempest, he shared with us his passion. He made the content of the class come alive. I have thinking recently about the apparent separation between 'content' and 'conversation' between 'transmission' and 'dialogue', I am coming to the conclusion that there is a false dichotomy being made. As an actor, I learnt how to memorise text, how to leave myself behind, how to reach out to my memories embodied to create not illusion but theatrical reality. As an aikidoka, I learnt how to repeat movements, to mirror my partners movements, to experience the energy in the connection between us. As a learner, I learnt which authors would excite me, would arouse my curiosity, would teach me what I needed to know. I have been thinking about the teachers who really performed, who really educated, and those who made no connection with us. Even their texts were poor, not even a brilliant performer could have brought them to life. Content is nothing without connection. Learning is nothing without dialogue. Education is nothing without morality. Connection for connection is pretty vacant. I think of the time that young kids spend on junk, on the net, in the canteen, at school. There is no beauty, no risk, no care, no feeling, just numbers, numbers, numbers. I have been thinking about one or two of the issues presented on Bill Benzon's blog 'New Savannna' quite a lot recently. I am reflecting on this business of 'Connected Learning. ', on education more generally. I also think he is right to change his choice of collocation from 'submit to authority' to 'respect authority' as he has done in the comment stream. I don't think that 'content' disconnected from a respectful relationship between co-learners is a vision of education to which I adhere to. I am pretty sure that Bill would agree with me on that. When an actor performs on stage, there is respect for the authority of the author but there is also respect for the essential role of the audience in bringing the story to life. When a teacher attempts/learns to transmit knowledge, there must be a respect for the dialogue between himself and the learners - they are sharing in an educational performance. It is for this that I would use the term 'co-learner'. Aikido for me is an educational model, the master transmits humility to his student in the pursuit of a common journey towards deeper understanding, through a series of learnt movements which only have meaning when enacted together. It appears to resonate for me as a metaphor for connected learning. Is this : "Just playing around?". Thanks, as ever, and again. We're pretty much in agreement on just about everything that matters most (to me, anyway). The only bit I want to emphasize, and it's probably also an area of agreement, is the value and necessity of study. To make another analogy, there's that moment when we aren't talking about the movie, we're watching it together. Yes, our viewing co-creates the occasion, but the thing we're studying is not simply ourselves. More to think about on these lines. Thanks for the continuing stimulation and imagination-play. And I agree fully about false dichotomies. Now I need to go leave a note for Bill because at least in the way I experienced the rambling conversation this week, he is where I got started. Thank you very much for makĺng some sense of this. We have 5 cats and a dog - so I identify with cat content. I am thinking about EMERGENCE at moment. I came here expecting a Devo video and now you have me thinking! Your comment reminded me of the existence of Devo and has me searching.